This past Monday morning when I got to school, I discovered that my classroom- which is a trailer behind our school- had been broken into and we had been robbed. The scummy thief turned over a trash can, pried up a window, pushed in the screen, and climbed right in. The thief took our 3 iMac computers that were in the classroom for student use. I suppose we were very lucky that they didn't take our projector, Elmo, or anything else from the classroom. However, we do not have any technology now that our students can use. This is a huge blow because all of our students had been using the computers to practice vocabulary, math and other important skills. Our newcomer students had been especially using these computers to help them practice vocabulary and use other language learning software. Now, we have no computers in our classroom for showing videos, powerpoints, or for students to use. My students are all English language learners, and most of them also don't have computers at home to use, so the ones in our classroom were all they technology they got to use! 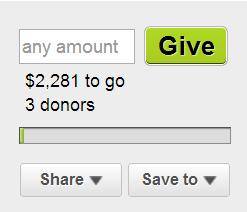 The only way I can imagine to recoup our loss is through DonorsChoose.org. The day that we discovered the robbery, I posted a project asking for two new computers to replace the 3 that we lost. I picked some nice computers that I new would last- the others were several years old- so that we would have them for students to use for many years. If you feel so inclined, please think about making a donation to our classroom. My students so enjoy the time that they get to use the computer, and it broke my heart to see the expressions on their faces when I told them the computers had been stolen. Click the box below to read more about our story and make a donation if you feel so inclined! Tara, You are so sweet! Thanks for stopping by. I am still so sad that I don't have any technology for the kiddos to use! They need it so much.